This all started as a set of apps associated with the Nanocoatings book. 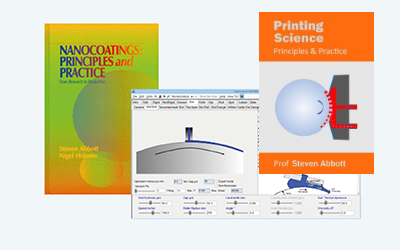 It gradually expanded to take in more coatings-related issues then expanded further as I wrote the Printing Scienece eBook which needed many more apps. It should really be called Practical Coating/Printing but it's too late to change the name. The division of the topics isn't ideal so you may have to look around to find what you need. The Search function works very well - I use it myself as I sometimes forget what I've written or where to find it. In both coating and printing, the emphasis is not on the techniques themselves but instead looks at the issues that affect the quality of the coated/printed result and/or the ease of carrying out the process. Many printers/coaters are unaware that some rather basic chunks of science can help them solve apparently mysterious problems. For those who are interested in web handling, go to Practical Webhandling. The apps are in an older format but are still very popular and still work well! The Solubility section takes you to the relevant Solubility and/or Surfactants pages, but the menu remains Practical Coatings so you don't get lost.